General Body Resolution to go for redevelopment. C.T.S. plan & property card for the plot. A consultant is basically a team of Architects, Civil Engineers and Legal Advisors. An Architect is required to prepare financial feasibility of project, Technical Analysis of offers of developers, verifications of building plans prepared by the developers, preparation of schedule of municipal process with developer. A civil Engineer is required to cross check R.C.C. drawings of the proposed building and check onsite quality of the construction. Legal Advisor is required to prepare development agreement and individual MOFA agreements of society members of developers and check other legal aspects of the proposal. 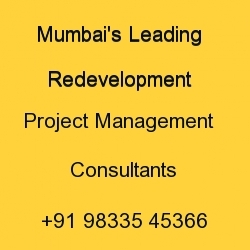 We are well equipped with team of experienced architects, civil engineers and legal Advisors. After working for so many years in the field of building Constructions, Reconstructions, designs and municipal approvals, we are well acquainted with development rules and regulations of M.C.G.M. and hence very well know how the maximum plot potential and benefits a developer can avail from any plot. Using that knowledge we guide society through entire process of redevelopment so that the members can get the maximum benefits from the builder and at any stage of redevelopment members do not get cheated by the developer. Our team of structural Engineers keeps check on the construction work and ensures the better quality of construction from the developer. To ensure redevelopment Passing general body resolution for redevelopment should be passed in AGM to go for redevelopment. Preparation of financial feasibility report. A feasibility report shall be prepared by studying existing building plans, consumed FSI, carpet area of existing members & available TDR/ additional FSI benefits. A report will be submitted by the society stating in the maximum benefits the members can demand from the developers. Preparation of tender to invite offers from developers. Preparation of Tender document, “Tender” is a crucial document, which is to be designed meticulously to avoid any kind of misunderstanding/argument during the course of project. Preparation of comparative chart of developers. A chart showing the comparative analysis of all the offers shall be prepared to Get the idea of the best offer received. Ranking shall be given to developers. Finalization of developer on the basis of report given by the consultant. On the basis of ranking , the projects carried out by the developers shall be Inspected , their market reputation shall be checked and accordingly the best developer shall be recommended to the society. While preparation of development agreement between society and developer inputs shall be given in terms of technical clauses which would Safe guard the interest of the society and safety of the project . The plans of proposed building prepared by the developers shall be verified in respect of planning , carpet area , area calculations, legalization and authorization of the area allotted to the members. Vacating the building after the builder obtains the necessary permission. The care is taken that the necessary permissions are obtained and legal formalities are fulfilled to secure the project by the developer before he ask the members to vacant the premises. So that the project doesn’t stuck up after demolition of the building. Demolition and reconstruction of building. After demolition and during construction of building the regular inspection is carried out to check the quality and speed of the construction. Possession and occupation of building.